Voters may vote by absentee ballot at City Hall. Office hours are Monday through Friday, 8:00am – 5:00pm. Before each major election, the City Clerk’s Department also offers special hours to correct the voter’s list and conduct absentee voting. Please call 207-667-2563 to verify dates and times. Voters may also call to request a ballot be sent by mail. An immediate family member (on behalf of the voter) may, in writing, request a ballot be sent by mail or delivered to the voter by that family member. Applications for an absentee ballot may also be downloadable through this web site as an election draws near. If you have any other questions about the voting process here in the city, please contact the City Clerk’s Office or call 207-667-2563. Municipal elections are held on Tuesday following the first Monday in November. During each municipal election, all positions are up for election. The State of Maine general and referendum elections are held annually on Tuesday following the first Monday in November. The primary election is held on the 2nd Tuesday of June of each general election year. Regular polling hours are open at 8:00 am and close at 8:00 pm. During Presidential Elections the City Council will often authorize poles to open at 7 am. There are 4 polling place locations within the City of Ellsworth. Voters are required to vote at the appropriate polling place location for their ward. Please contact the City Clerk’s Office at City Hall for the location of your ward. 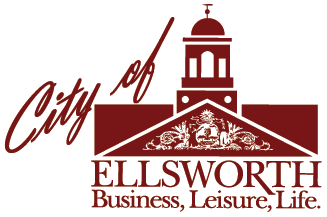 Ellsworth residents may register to vote at the City Clerk’s Office at City Hall during regular business hours. Proof of residency and proof of identity is required, such as a driver’s license indicating a physical street address in Ellsworth (not a post office box mailing address). If your driver’s license shows a previous address, please bring other documents (such as a check book or utility bills). Visit Maine.gov for information on Voter Eligibility. If you are currently registered to vote and wish to change any information pertinent to your voting record, such as your name or address, visit the City Clerk’s office or mail the new information to: City of Ellsworth, City Clerk’s Office, 1 City Hall Plaza, Ellsworth ME 04605.